"Father of the 26th Amendment"
the injustices in the world, and are anxious to rectify those ills." "The Father of the 26th Amendment" introduced legislation eleven times -- in the U.S. House of Representatives and later in the United States Senate -- to lower the voting age, beginning in 1942 until its passage in 1971. Due to his persistence, 18-20-year-olds have had the opportunity to vote in eight presidential elections. ROTUNDA RALLY – WV Secretary of State Joe Manchin, III (seated left) hosted a 30th Anniversary celebration commemorating West Virginia’s ratification of the 26th Amendment. 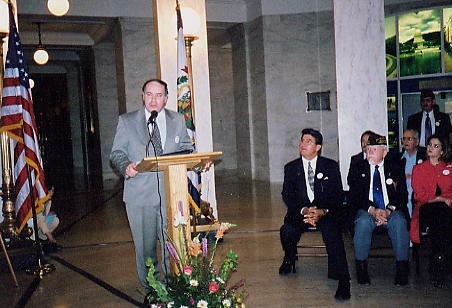 Speakers included JRRP director, Nick Hollis (standing), VFW Commander Don Kinnard (center), "Miss West Virginia" Jodi Clark (right), and others. In his later years Jennings Randolph grew very concerned about the widespread cynicism of America’s youth. He frequently exhorted them to exercise their "franchise of freedom:"
and how much we care. Jennings Randolph met with youth groups regularly. As host of the annual National Youth Science Camp delegates and YMCA National Youth Governors in Washington, he provided inspirational discussion time for young leaders with senators from their respective states. 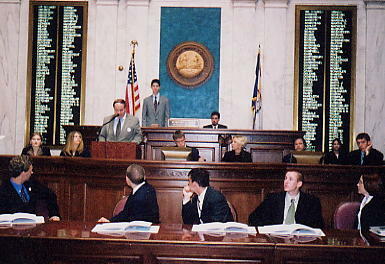 WV LEGISLATURE – Delegates listen as Nick Hollis describes Jennings Randolph Recognition Project (JRRP). Citizenship workshops continue at YMCA Camp Horseshoe every summer for young leaders from Michigan, Ohio, and West Virginia. For excerpts from YMCA talk on 26th Amendment, click here.